Anne and I have been lvinig in Scotland for about 4 months now. It has been fun, and a challenge figuring out the ways of life here. I have been very busy - which is why the first picture update took four months. Graduate school is interesting, but lots of work. We haven't done as much exploring as I would like, but as you will see, we have visited a few places. 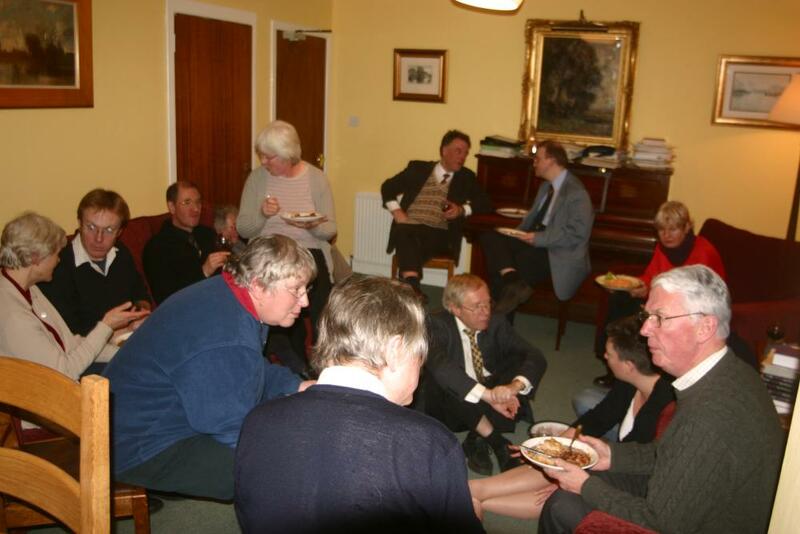 We spend most of our time at the University in St. Andrews or at our home in Cellardyke resting. 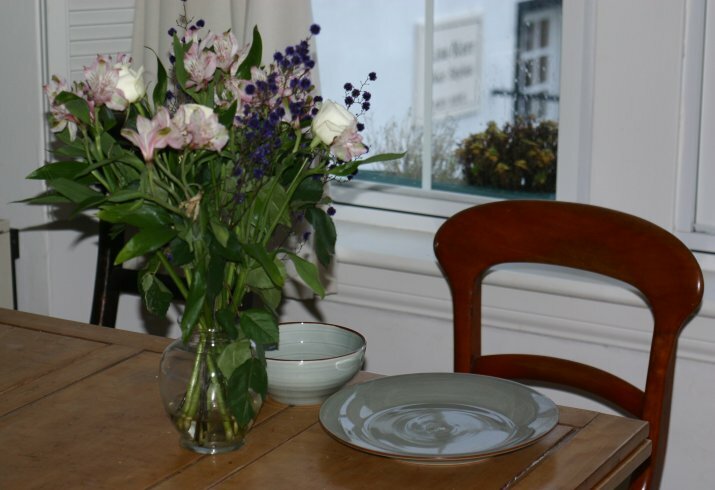 Our house looks much as it did before we moved in, pictures of which you can see on the Cellardyke page, although we have added some of or own furniture. Below are a few pictures of our life here. Click on the images for larger versions (approx 80k each). 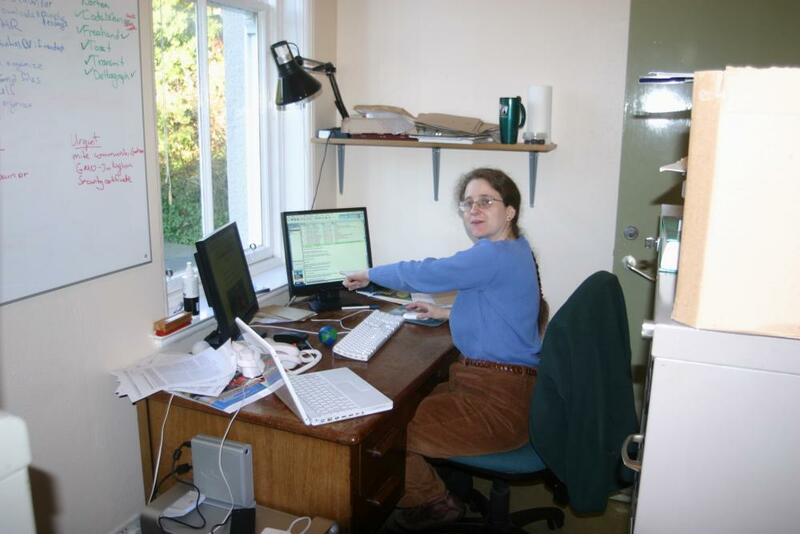 Anne in her tiny office. She is scheduled to move to a larger office in the same building soon. 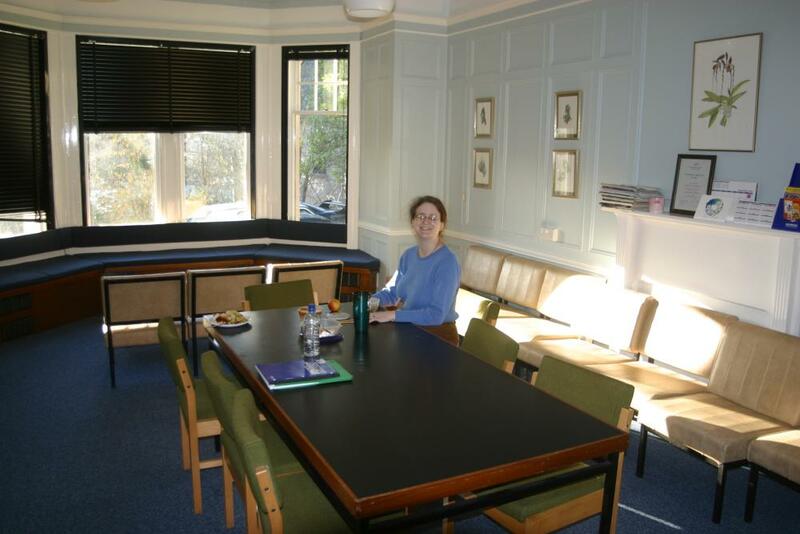 Anne in the Seminar room / lunch room downstairs in the building where she has her office. 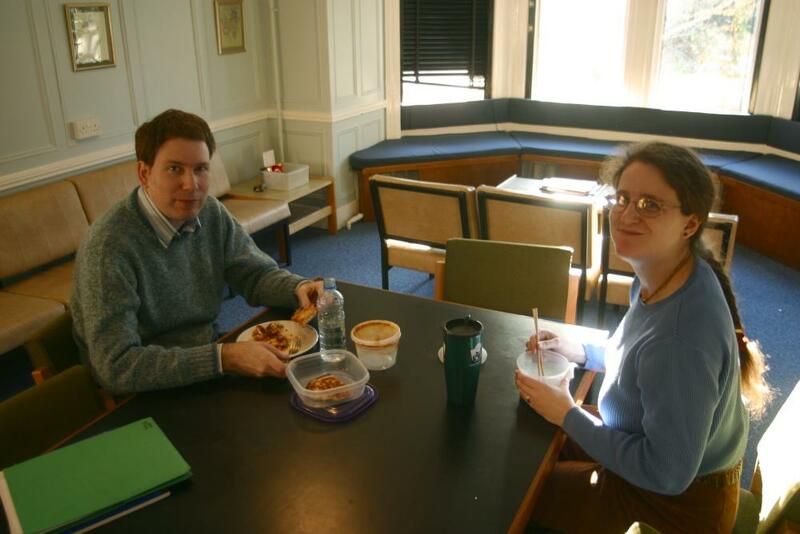 David and Anne have lunch together in the Howard Mitchel Building. 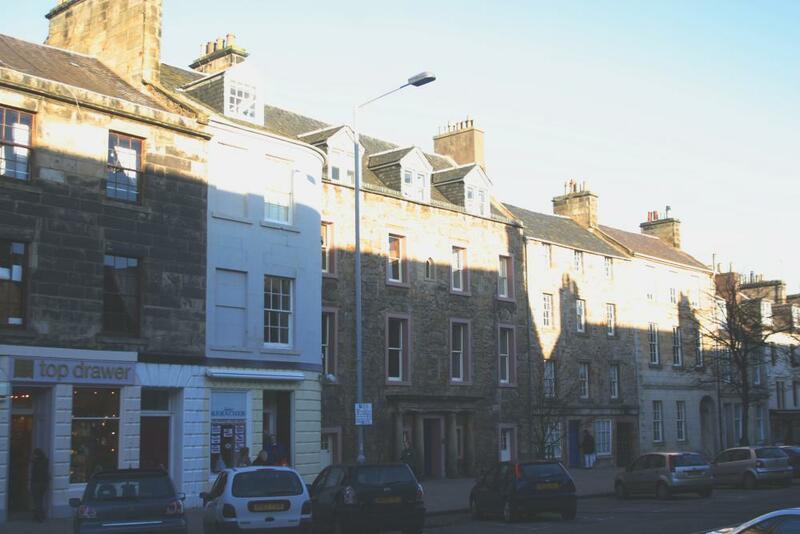 South Street in St Andrews. 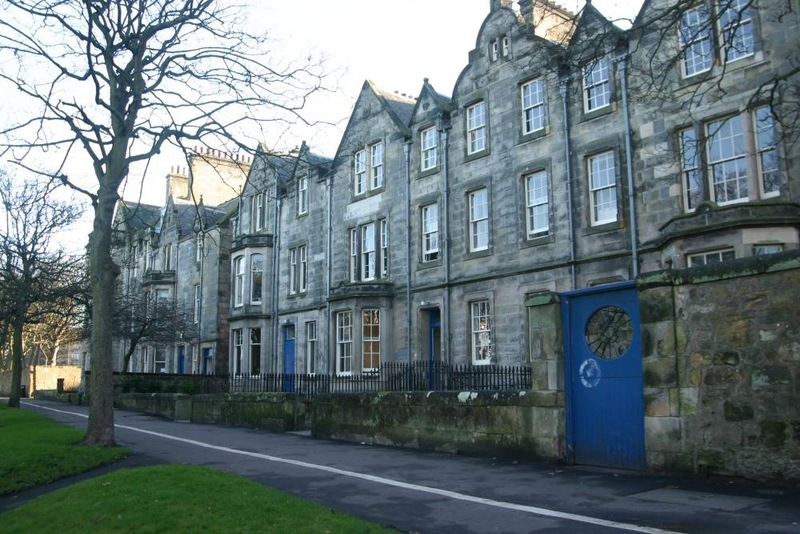 The Blue doors are to St John's House, home of Medieval History and Reformation Studies departments, and where I have some of my classes. St Katherine's Lodge, home to the Modern History department, and where the rest of my classes are. Blue doors seem to indicate the History School. 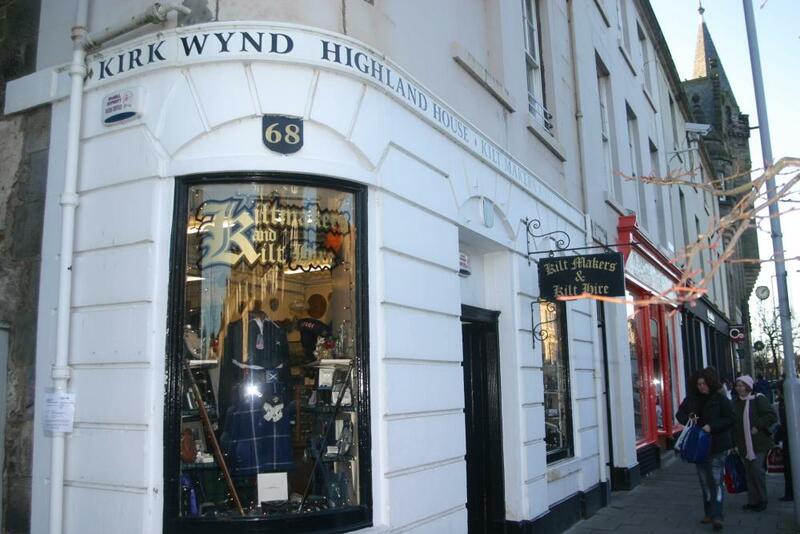 In case any of you doubt we are in Scotland, here is the kilt maker's store in St Andrews. 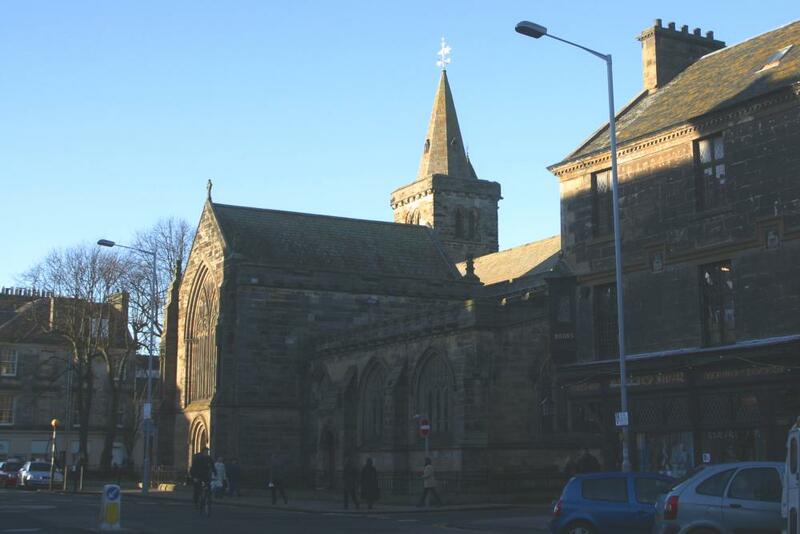 Trinity Church in St Andrews. The Renaissance Choir of which I am a member gave our concert here. I'm in the Renaissance Choir. Sadly, no pictures of the concert, since I was busy singing. This is the Christmas party at the director's house. That's him sitting on the floor in the middle. The Renaissance Choir Christmas party. 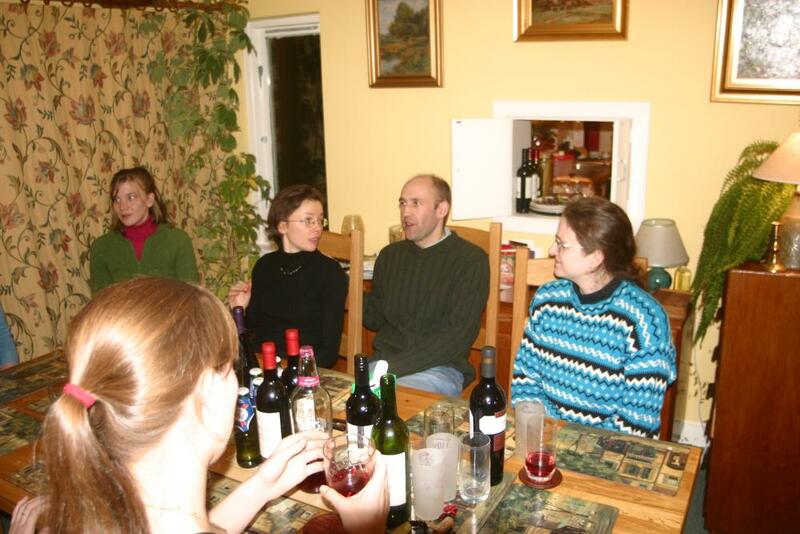 In the middle are Bridget and Guy, two history faculty, and friends of ours. 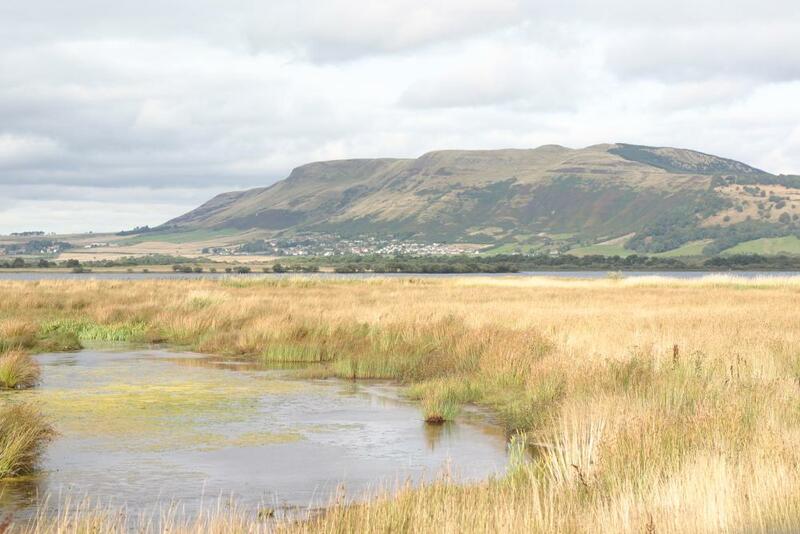 One of our first trips was to Loch Leven, the largest lowland loch. 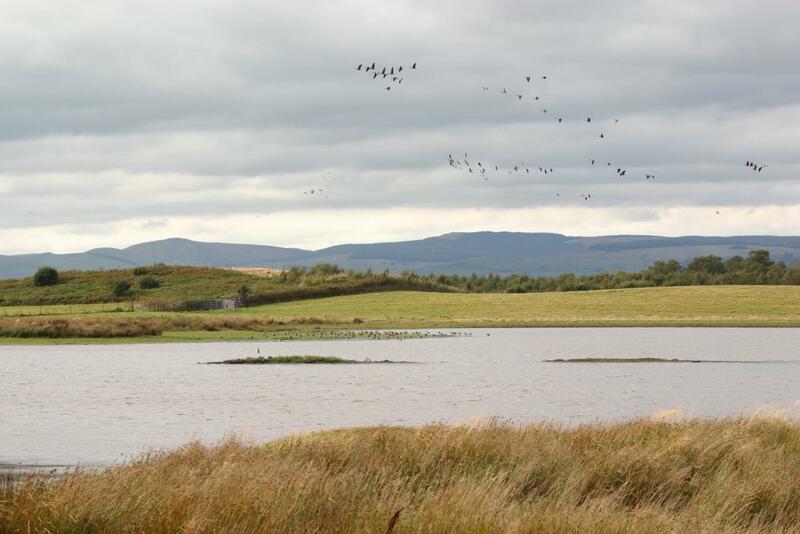 Loch Leven is the site of the Royal Society for the Protection of Birds Vane Farm Preserve, and home to many water fowl. 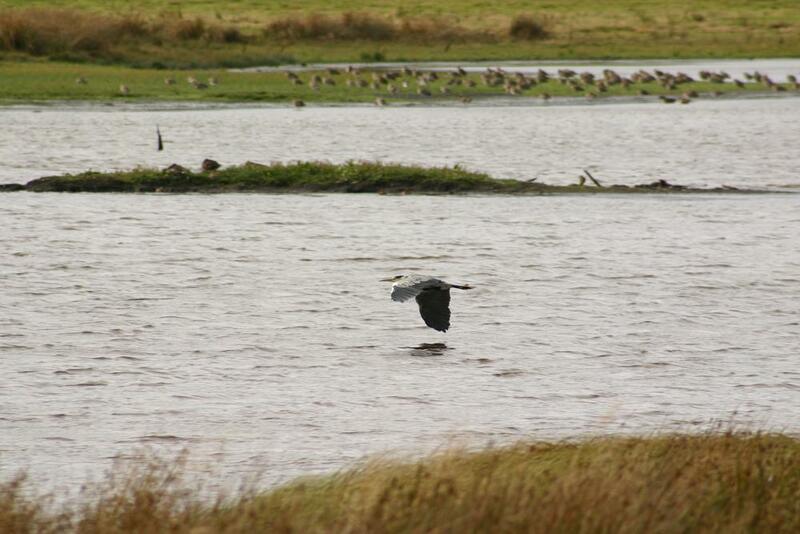 We became members of the RSPB, and looked at the many birds who stay at the lake. 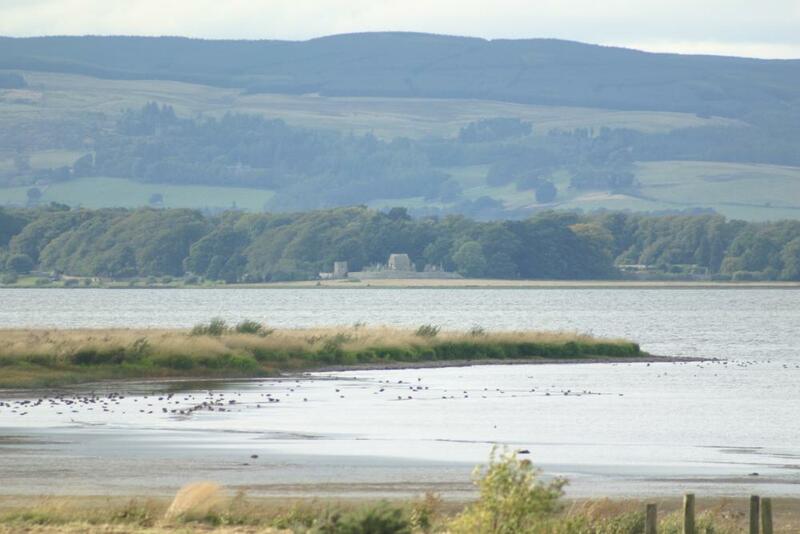 Looking across the loch from the bird sactuary to a medieval church at Kinross. 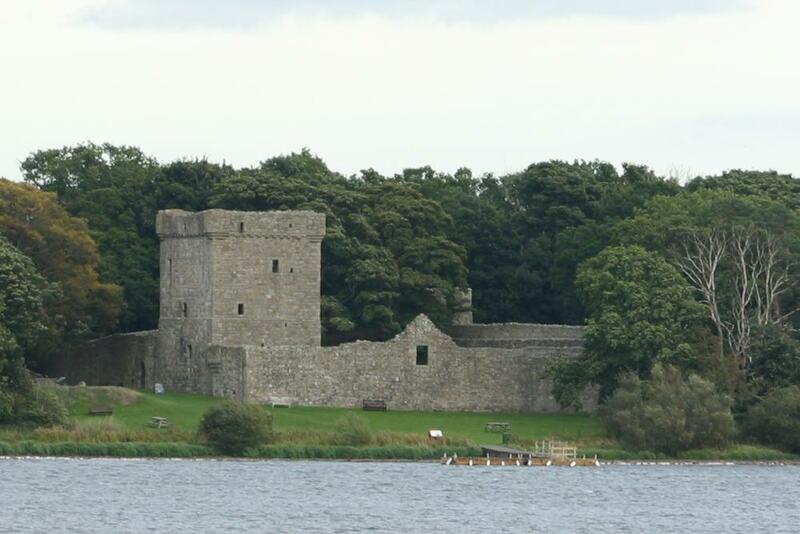 Loch Leven Castle on an island in the loch. 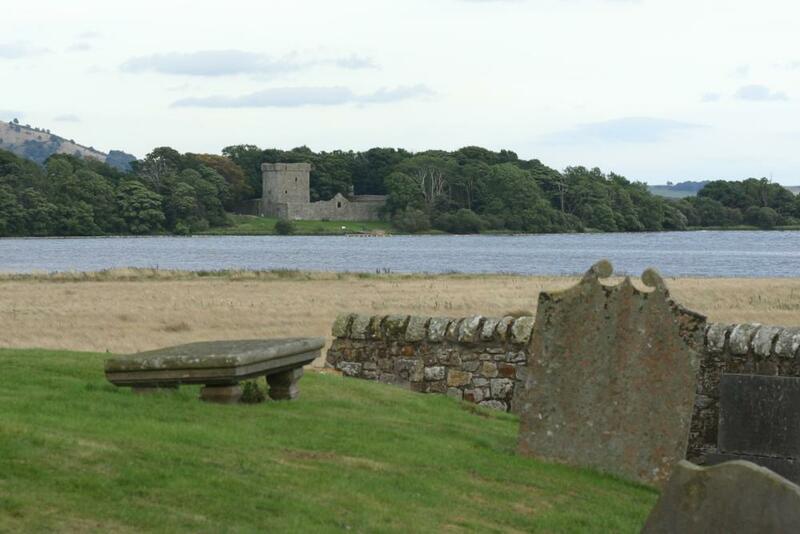 The castle was standing by the 13th century, and Mary Queen of Scots was imprisoned there in 1567. 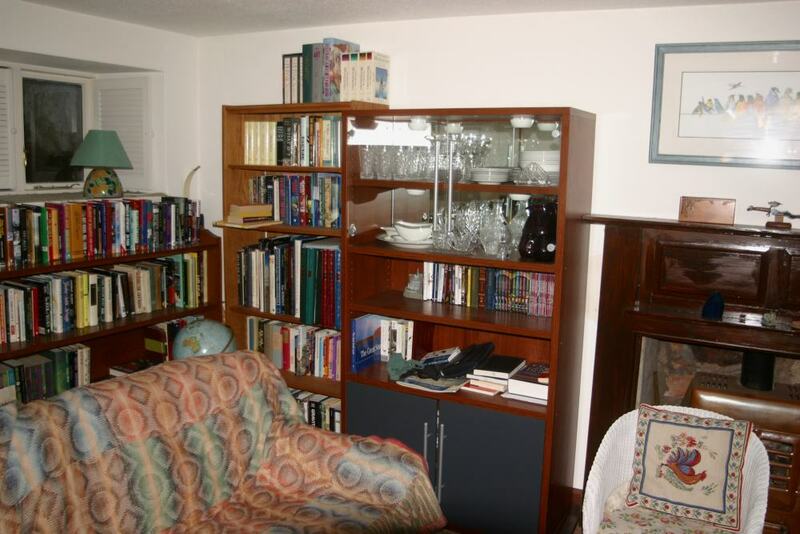 One item of furniture we added once we got here is a shelf unit to hold our china and crystal in the living room. Our dining table with our plates and flowers from Thanksgiving dinner. We had people over for Thanksgiving, but I forgot to take pictures while they were here. 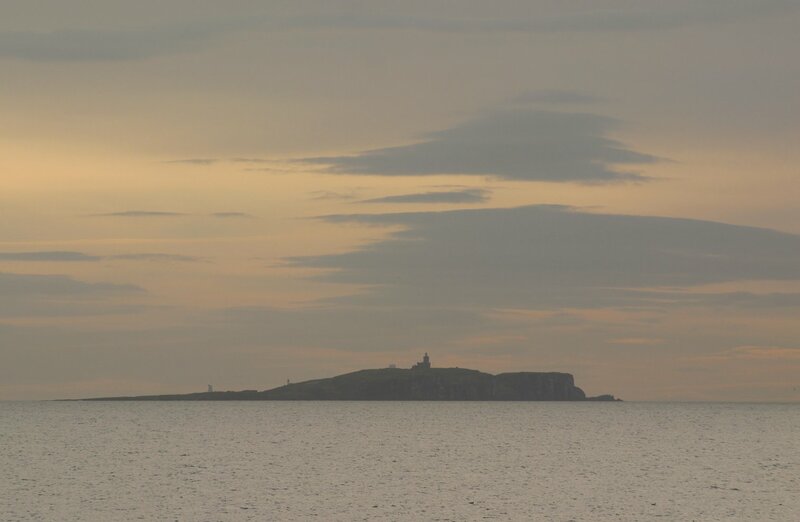 The Isle of May at sunrise from out of the front of our house. 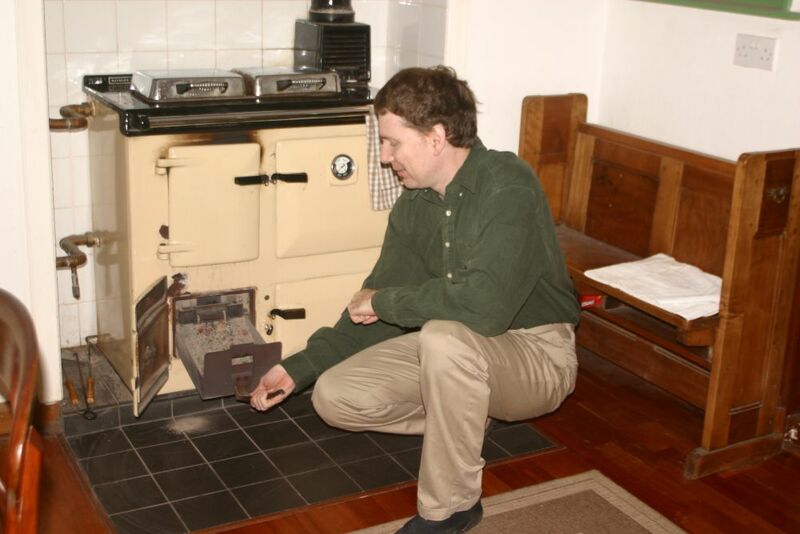 Here is David emptying the ashes from the Raeburn stove, which we use for heating water, heating the house, and about half our cooking. Indy in the window. 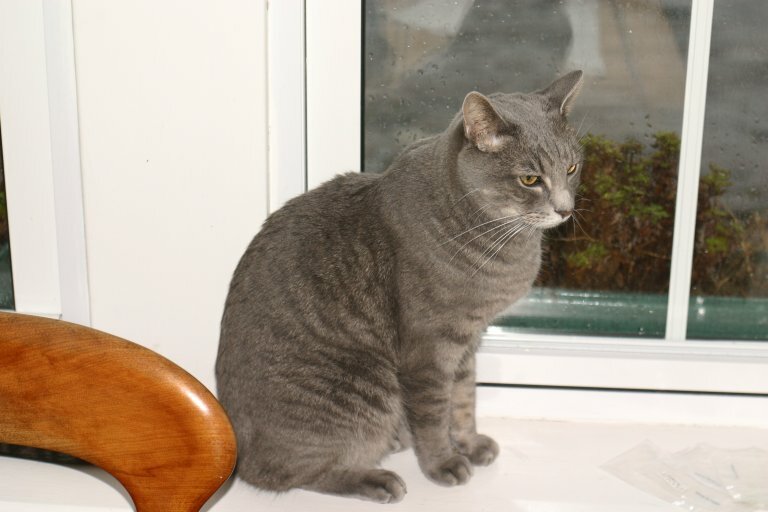 The cats enjoy sitting in the windows, which have large windowsills. 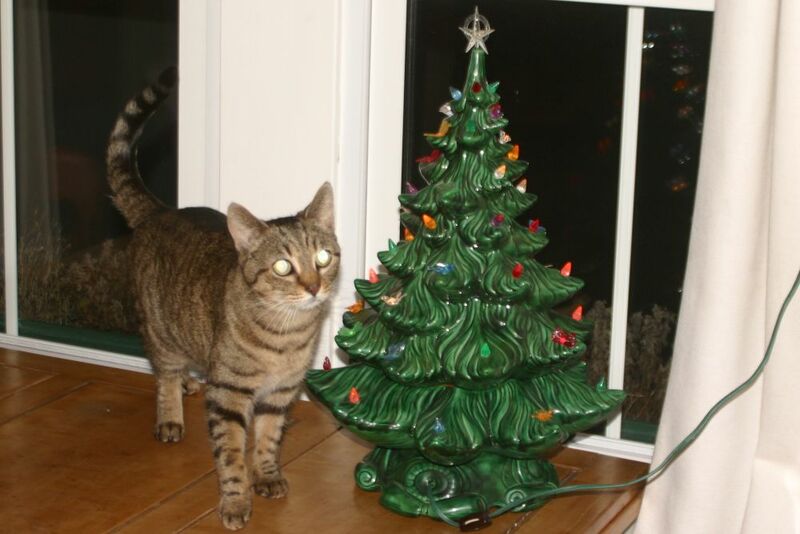 Molly by the Christmas Tree. The tree was Anne's grandmother's and is set up on the table next to our front window.